I’m wrapping up my crafting for 2018, I think. For my vintage ornament wreath #2 this season, I started with a similar red-green-silver-goal base/back/bottom as in wreath #1. 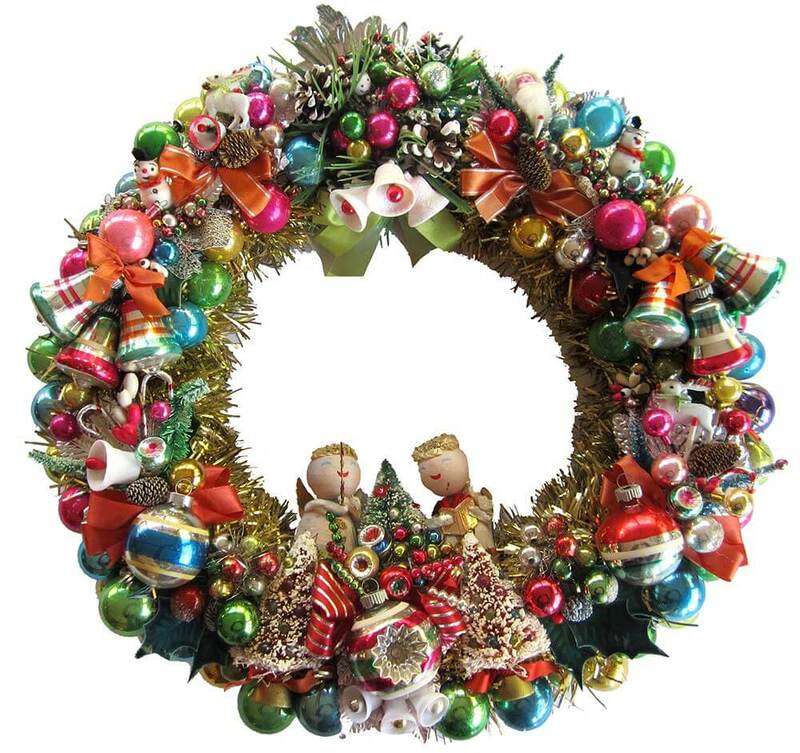 But on top of that colorful kitschmas party, I decided I’d try to select richer, darker, older looking ornaments — note the black — to distinguish this wreath as more Old World Christmas. I wanted it to look … tarnished. I love how it turned out, so much so I got out the good camera, the camera stick, and the lights. Viewing tip: On a laptop or PC, once the page has fully loaded, click on any photo (in any story, not just this one) and it should double in size on screen; hit ESC to get back to the story. I’ve done about 12 wreaths now, and my ‘system’ is to build focal points — usually in three spots — at about 2 o’clock, 5 o’clock and 9:30 o’clock — around the wreath. Starting, I also usually have an idea or concept for each wreath, usually built around a particular color palette and with a certain ‘personality’ in mind. Like I said, this one is Old World Classic red/green/gold/silver. 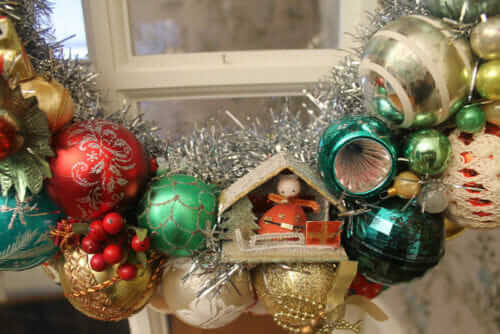 I try not to ‘repeat’ the decorative weebit types on top — that is, I only use one wood weebit ornament, one china ornament, one putz house, one pine cone elf, one reflector, etc. I always include one wood character who is missing limbs; my homage to Rudolph and the Island of Misfit Toys. 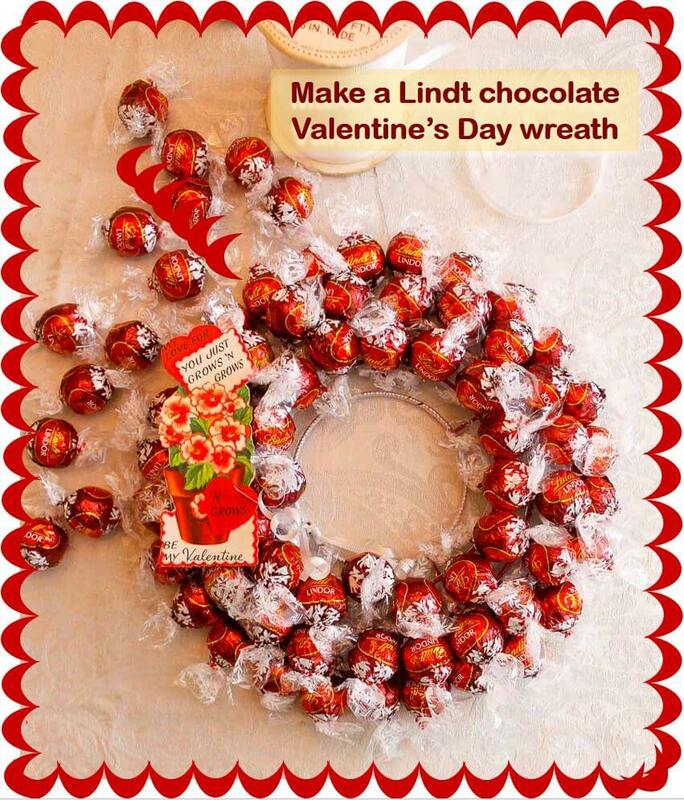 Okay, so this wreath has two corsages. 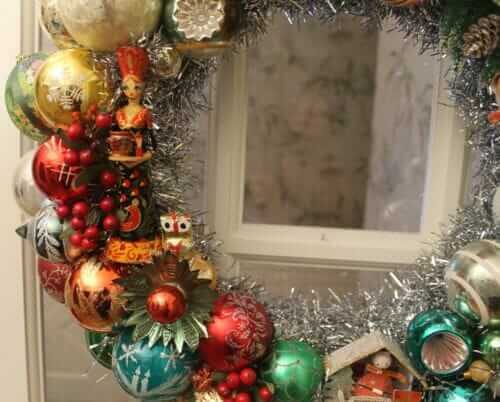 Remember when April made that wreath using 10 vintage Christmas corsages? Yes, I stole the idea from her — instant focal point! Note the berries used as filler — those are cut from vintage floral picks, another great item to look for at thrift shops, estate sales, etc. I got these red berries — incredible quality — in a bunch of New Old Stock Made in Korea vintage floral picks scored last week at the local Goodwill. 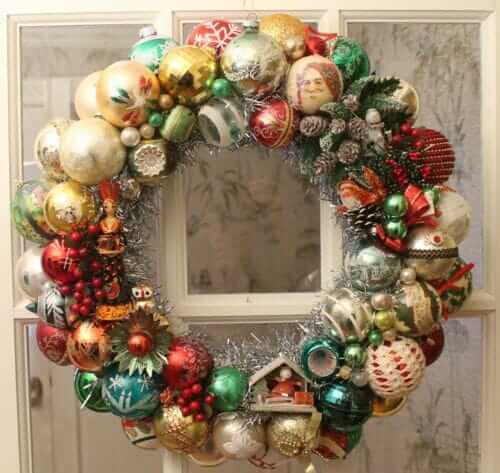 Pretty much everything in my wreaths are found a local estate sales. Some of the base ornaments (base/back/bottom row/outside ring) are new. I never fill in the inside ring — I much prefer seeing the ‘white space’ of the donut hole… I like seeing the tinsel, it brings light to the wreath and in its way makes it easier to ‘see’ the ornaments… and I like the added challenge of having to work within that open ring. 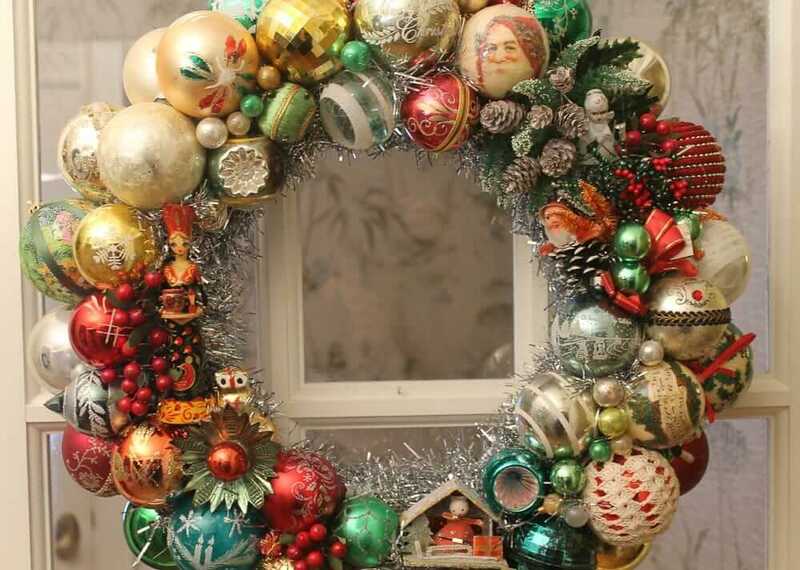 I counted: This wreath has 78 ornaments on it — 20 around the perimeter, 57 on top. 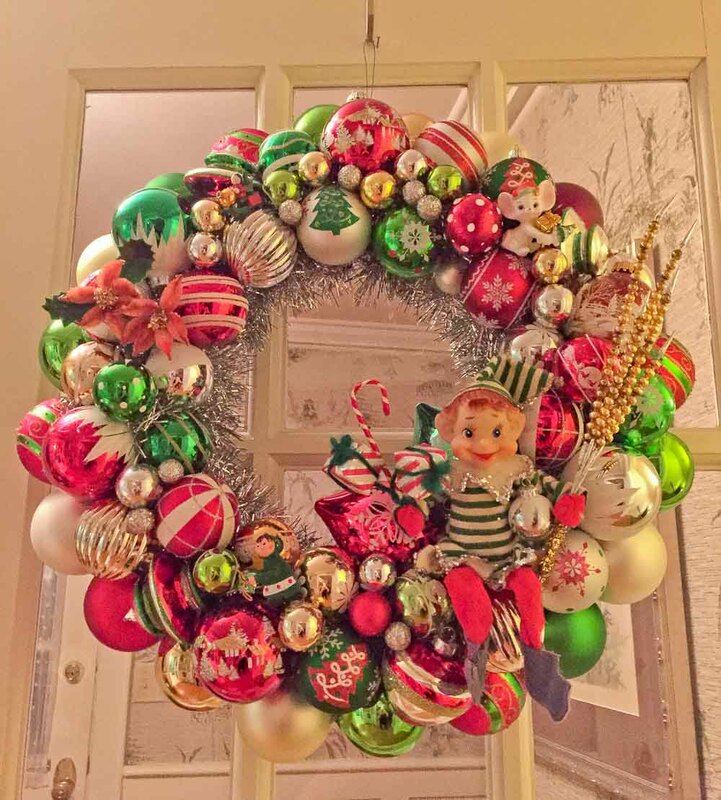 See all our wreath stories here including our mega-tutorial where I’ve also archived all my finished wreaths going back a few years. 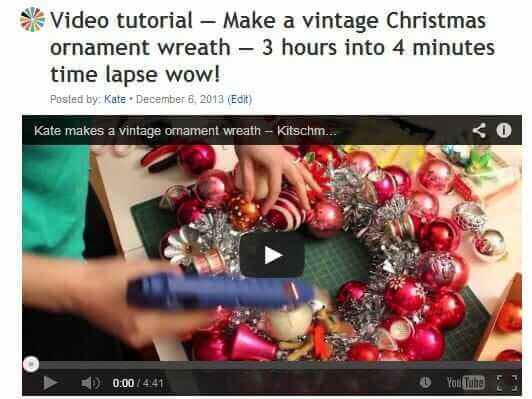 Video tutorial — Make a vintage Christmas ornament wreath — 3 hours into 4 minutes time lapse wow! 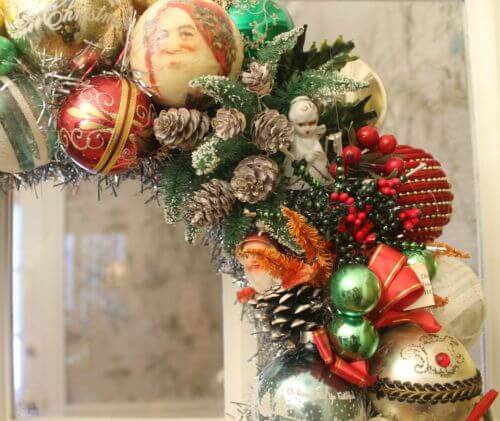 Are the ornaments on your ornament wreaths coming loose?